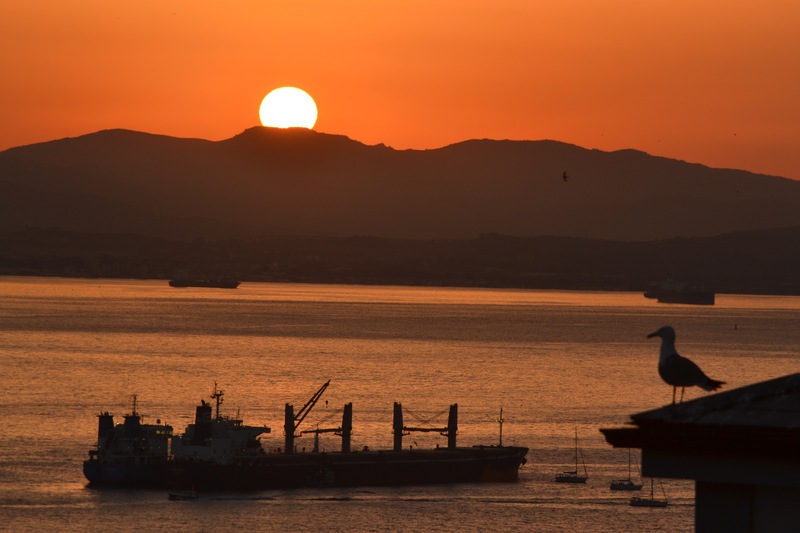 Hello from a very warm Gibraltar. Blimey summer has definitely arrived. The temperature has risen considerably and I don’t mind admitting I’m wilting a little! It’s ok in this temperature when you are on holiday and doing nothing in particular but it’s hard work when you still have to cook and clean and rush around doing things. This blanket was started during Lent when I was crocheting a granny square each day. On days when I was super keen and wanted to do more crochet I did a bit of this. Once Lent was over I put it aside to do a few other bits and pieces and only revisited this last week when I headed back to Manchester to visit my parents. 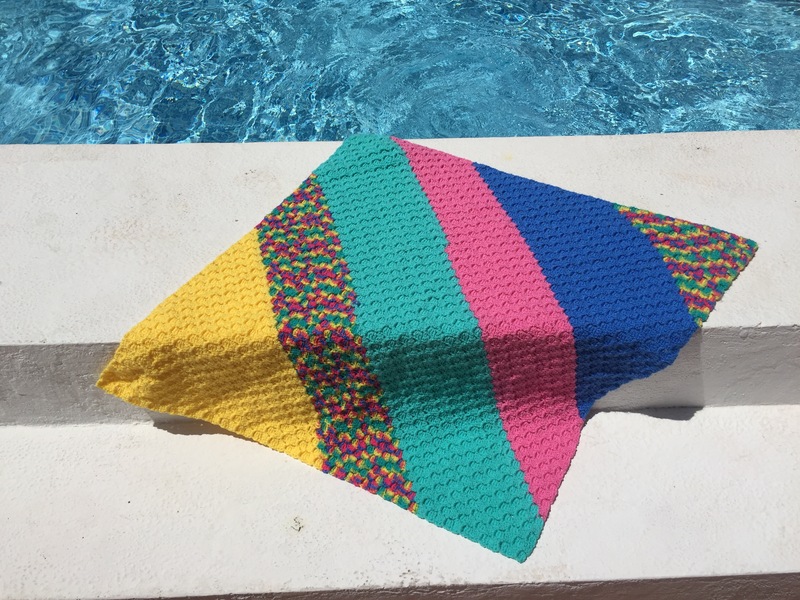 It was completed on Sunday and I took it to the pool for an arty photo shoot 😉 it’s comprised of 10,608 treble stitches and brings my total Sixty Million Trebles tally up to 33,864 for my three blankets to date. For those of you who haven’t heard of Sixty Million Trebles before it’s a charity and awareness raising appeal to make crochet blankets totalling sixty million treble stitches (one treble stitch represents one refugee in the world – figures from the UN in 2016). The blankets will be sent to Syrian child refugees. For more information see: the Sixty Million Trebles Facebook page. I abandoned the car for most of this week and decided to walk whenever I could. It meant that I wasn’t able to fit quite as much into my child free hours while the Little Postcards were in school, but I did enjoy being able to appreciate my surroundings a lot more. 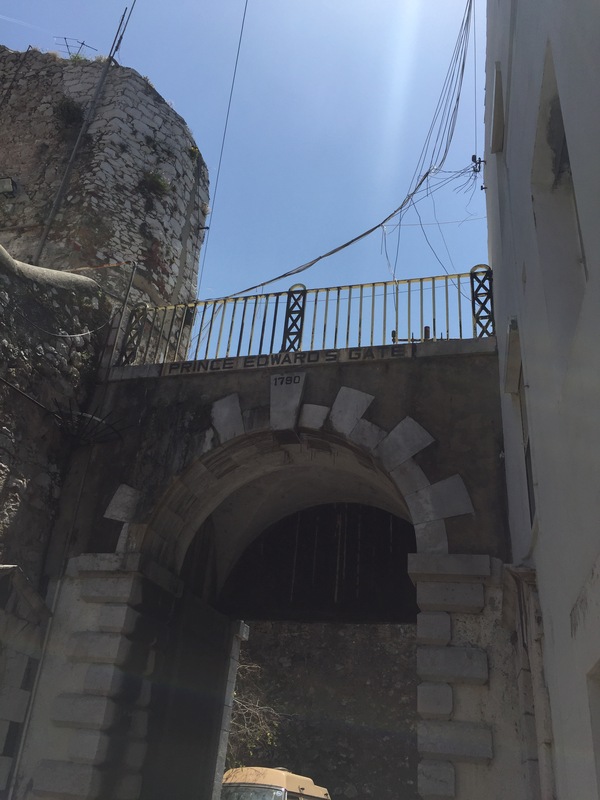 There are so many interesting buildings and nooks and crannies here in Gibraltar which you can drive past in a blur so easily. I won’t have a body fit for a bikini, but I have walked a good few miles this week! 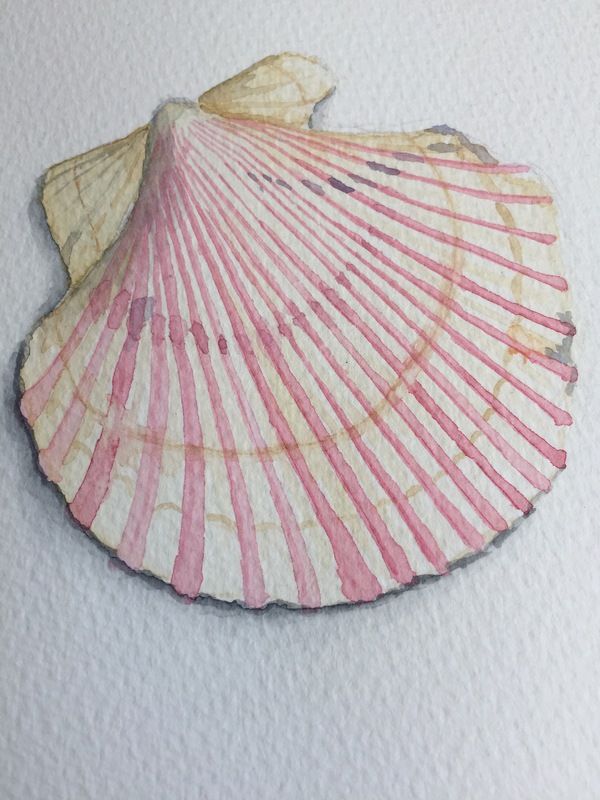 I put the finishing touches to some of my seashells this week at my watercolour class. I have really enjoyed painting them and have come to the conclusion that perhaps I’m better at small focused pieces than larger landscapes and compositions. I have to confess that I don’t know what these flowers are called but I have seen quite a few about of late. 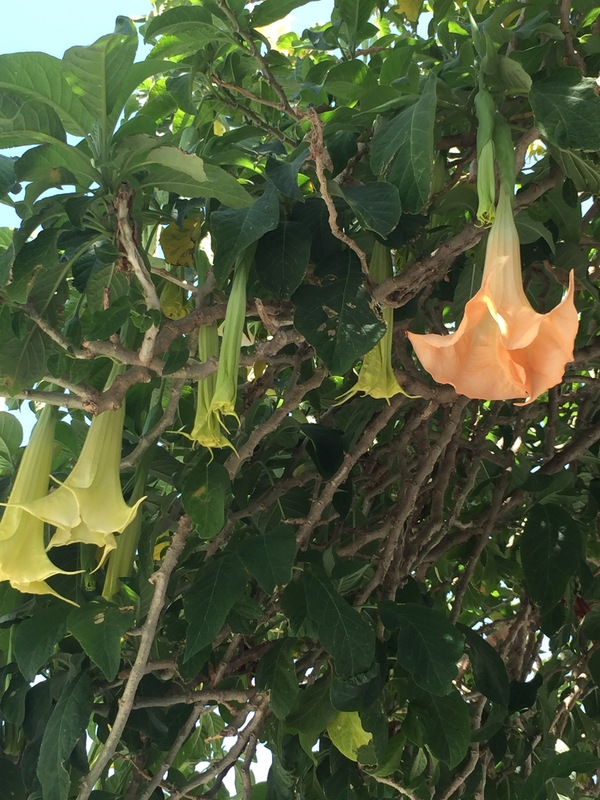 In fact there are a lot of gorgeous plants in bloom around Gibraltar at the moment. They seem to be at their peak before getting frazzled in the hot summer sun. “Not another one?” I hear you say. Well there is blogging, taking loads of photos (although I am not a photographer by any means), sewing, painting, crochet, reading… I really don’t need another one but I may have found a new way to dodge doing housework! A friend of mine is a rather accomplished ‘felter’ – is that a word? (Well someone who makes delightful pictures with felted yarn). This week she very kindly showed me how to do it too over the course of two lovely lunches and afternoons. I took loads of photos and at some point in the next few weeks I hope to be able to share my foray into felting with you too. Ooh it’s such fun! The time has finally come, that time of the year where you no longer have to make school packed lunches, but you do have to come up with afternoon entertainment for the kiddiwinks. 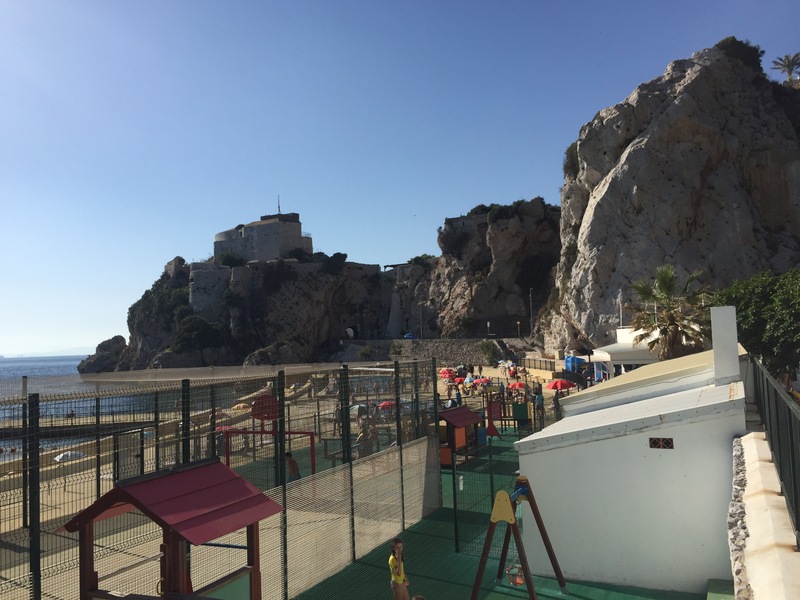 Friday saw the end of full days for school children in Gibraltar. With just three weeks left until the end of the summer term, it’s half days from here on in. 9am to 12 noon for first schools and 9am to 12:45 for the older children. Hmmm, I will be so happy not to have to figure our what tasty delights to put in the lunch boxes of an evening until mid September, but crikey, what am I going to do with them for all that extra time? I don’t remember constantly asking my Mum what her plans for the day were as far as entertaining me and my brother were concerned, but that seems be the norm for me and the mums I’ve spoken to. We may be exploring boredom and room tidying in the coming weeks… I cannot face the beach everyday! I shall round up this week’s Sunday Sevens with a photo of last night’s Saharan Dust sunset. It was lovely and completely different from the rainbow sunsets we’ve had in recent weeks. I grabbed my camera as I spotted some seagulls sitting on a nearby roof enjoying the view as much as me! We are enjoying a Bank Holiday weekend this weekend, schools and many workplaces are closed tomorrow in honour of the Queen’s birthday. That means that many Dads who are able to enjoy Father’s Day today, can get a second lie in tomorrow too! However you spend your day, I hope it’s a good one for you. Love the shell painting – and yes, I agree, felting is fun!!! 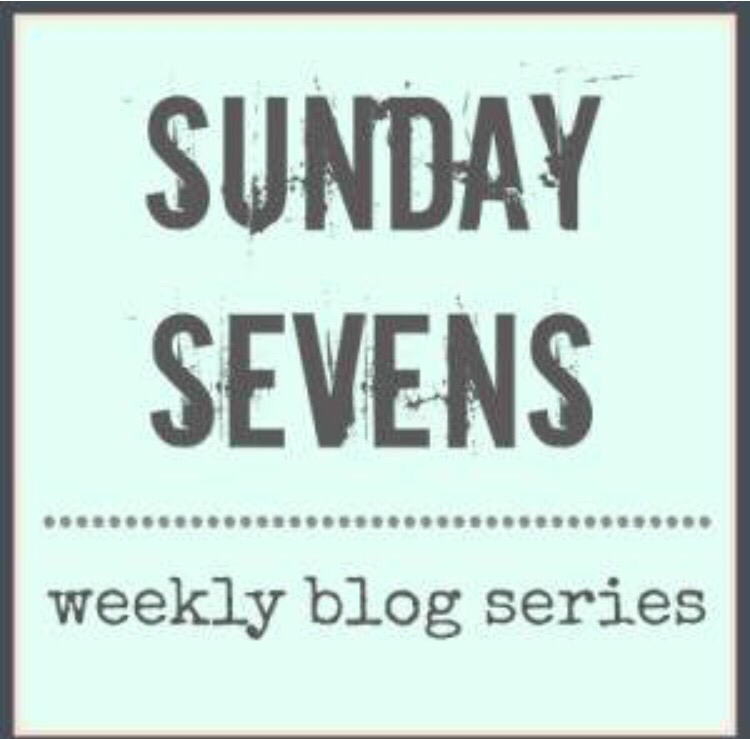 Lovely blog post again. I like the part about not having a bikini body (me neither, by far!!) but as you walked you enjoyed your surroundings often missed when in the car. I think that all of us miss out on things around us when we are hurrying somewhere (such is life so often!). It’s hot and humid in my part of Kent this week too, housework is definitely too much to tackle so also dodging it, he he. 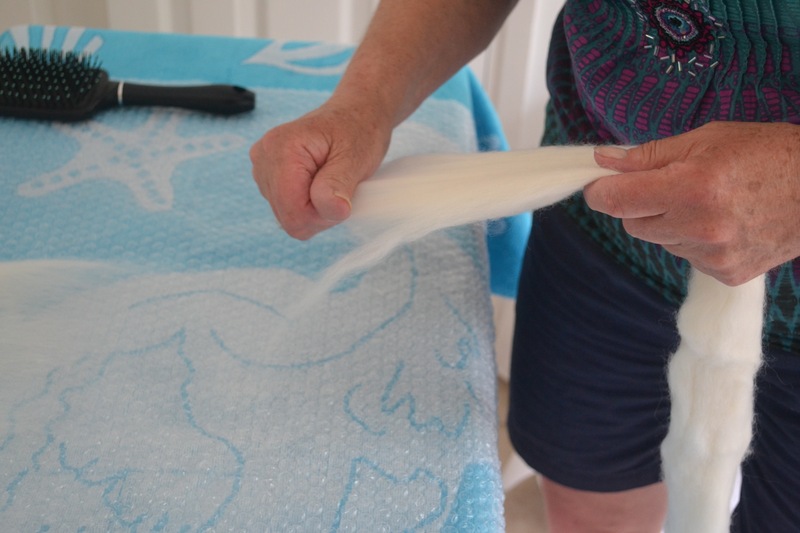 What kind of felting are you playing with – wet or dry? Looking forward to seeing more. I did a little bit of both in a mini class last year – it was lots of fun. Good luck finding things to do with the little postcards. Summer holidays can seem long … and expensive when they need entertaining ! Am sure we entertained ourselves and on the cheap ! Oh thanks so much for that. I’m glad I’m not alone in the bikini body and housework dodging stakes! 😉 I’ve done wet felting with my friend this week, and then I’m doing a little dry felting on top along with some embroidery to bring out the features. Yes, summer holidays are very long! We have 8 weeks here along with four and half weeks of half days. A lot of parents relish this time of year, but I’m afraid I find it quite hard at times… I think the key with having 3 boys is to wear them out. I once heard it said ‘having sons is like having pet dogs – you need to exercise them to wear them out’ so true!! I completely agree with entertaining yourself… I don’t think I would have enjoyed crafting so much as a child if I had had all my days planned out for me, the best games and pass times are self generated I think. Sadly my kids aren’t too great at that. I don’t know if it is down to me doing too much for them or a collective lack of imagination in today’s kids who can download a new game at the click of a mouse for free. That sunset is amazing! Wow, great photo! I look forward to reading about your felting adventures!